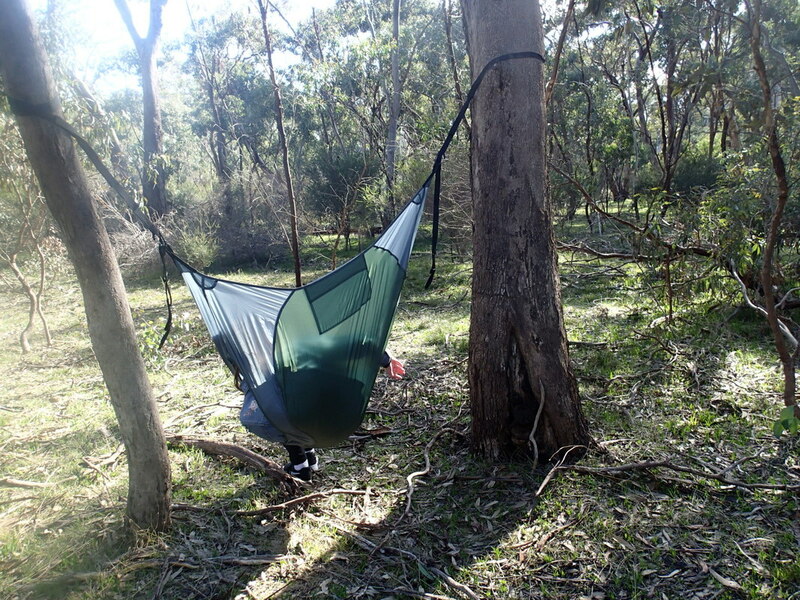 There has been a great rise in the use of hammocks for camping due to their comfort, flexibility and ease of use. We have owned a few of them, and some members of our family vastly prefer them to camping in the tent. It's a personal decision. We were offered the chance to review the Chammock. 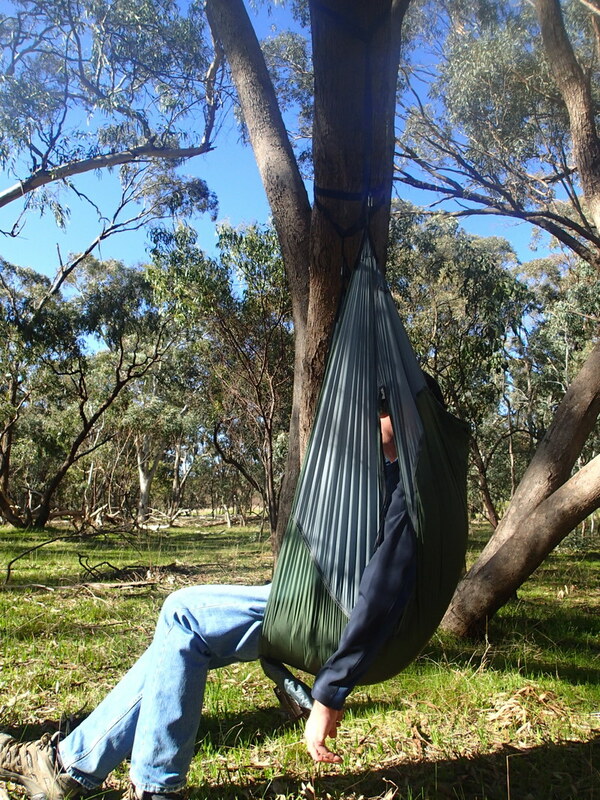 Think of it as a cross between a hammock and a chair. ​The concept has been well received by the outdoors community, and the Chammock is certainly something different. So what did we think of it? The concept behind it is great. A very lightweight chair which is very compact and takes up a very small amount of room in your pack. We received the original Chammock plus the tree friendly strap set (2 straps). Both come in their own pouches, and getting the gear back into the pouches was very easy. 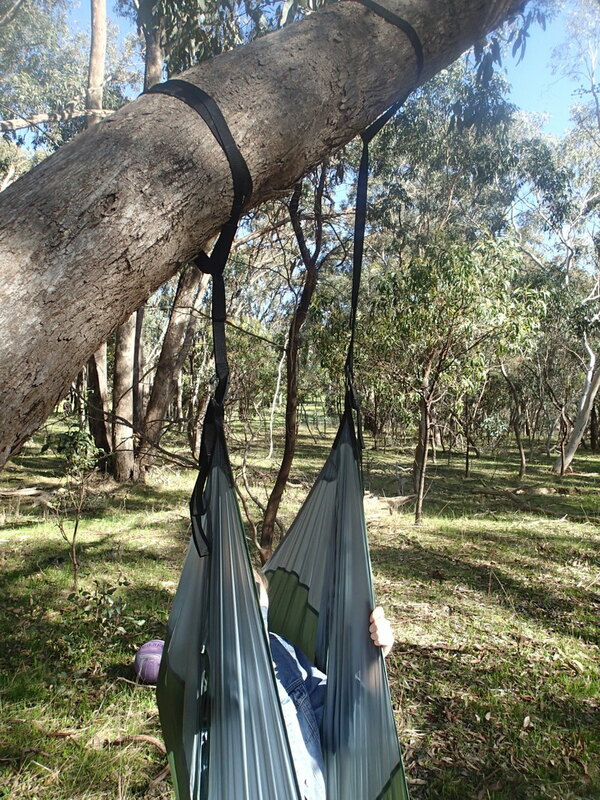 There were no instructions included on the best way to use this Chammock which could be a problem if you haven't ever had to set up a hammock before. The Chammock comes with a strap included, but no information on how to use it in conjunction with the separate straps. There is an assumption that you will need no help. We knew the basics from our own hammock experiences, but a novice may not know. We decided for this review, to be total newbies, and not know a thing about hammocks. We had to then find a spot to this Chammock out. With the Chammock in hand, to find the perfect spot was the trickiest part. Not every campsite is ideal for a Chammock or a Hammock, and that is a risk you run if that is the only chair or sleeping option you have. Looking around, we were going to try to do set up with MINIMAL effort. If setting up a chair is complicated, I don't want that, so we decided to use the most basic set up we could find. That means either 1 tree, with a low overhanging branch (sturdy) to wrap the straps and attach the Chammock, or find 2 trees relatively close together to string the Chammock up. 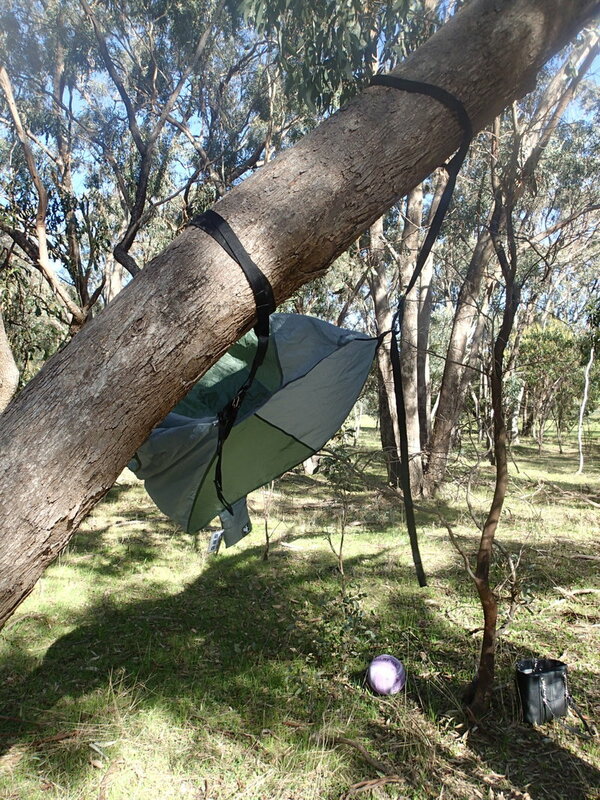 Firstly, we chose the option of using an overhanging tree branch to be our Chammock location. This involves wrapping the 2 straps around the branch, and with the carabiners attach the Chammock to the straps. Easy, and fast method. You don't want to have the straps too far apart, as the further they are apart, the more it seems that the there is less give in the Chammock and you can't relax back into it. 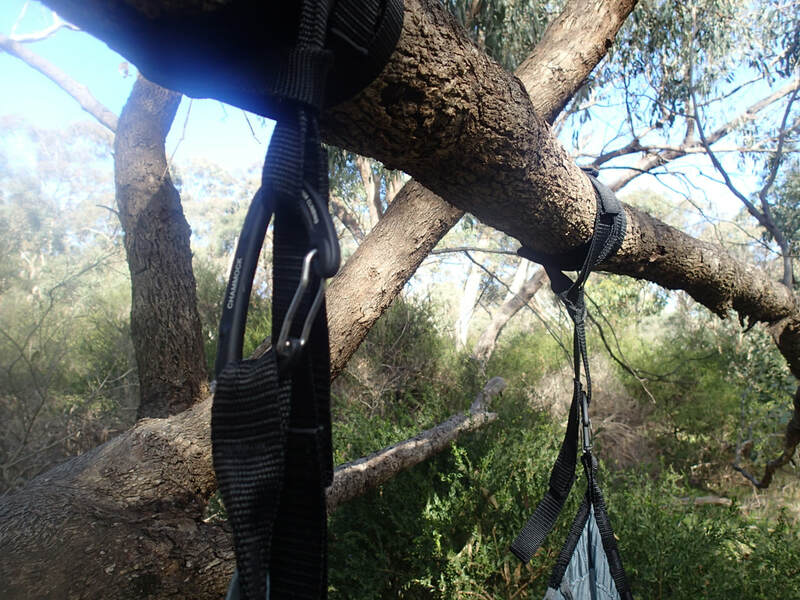 Second option was to hang the Chammock over one branch that wasn't overhanging but a branch that was leaning over, to allow ease of attaching the straps. Reason we tried this option comes back to the fact that when you are out camping, not every site is going to have the ideal set of trees nearby, and you need flexibility with your set up. This meant adjusting the straps around the tree at different height on the branch, and setting up. Below, is the Chammock blowing in the wind, and then stabilised with someone in the Chammock. Third option, was hanging between 2 trees, which based on the website for Chammock is the preferred set up. We had to find 2 trees close together to allow this to happen, and it wasn't easy! See above. That's why our first 2 set up options were our preferred way of using the Chammock. Note: you will see we are not using the strap that came with the Chammock in above photo. A newbie may not have known what to do with it, so we went along with that concept as well. We used only the 2 straps and the Chammock. The website for Chammock, uses the 2 straps, plus the strap that comes with the chair to use. Their method would give you greater flexibility in where you use the Chammock, as you would have more tree options to choose from. You can see the way Chammock manufacturers recommend in the video below, and something we did NOT do, is use the 1m strap that comes with the Chammock between the 2 carabiners, which is to allow you to lay back more. But there were no instructions on this with the Chammock, so a newbie may not have known how or when to use this. If you are wanting a comfortable spot to hang around camp - but have a back up option - then this chair was pretty comfortable, especially in our first 2 options. It did take a bit of trial and error to get it right (height off ground and spacing of straps). Once we were happy with that set up, sitting in the Chammock was comfortable to a certain extent. We found that once you sat on the Chammock, there doesn't seem to be a lot of material spare, so your legs get channelled into a narrow area, and the material cuts into the back of your legs. A larger person would find this quite constricting, and possibly uncomfortable. See below image - you don't have the option to widen your legs further apart....they sort of fall together! A way to alleviate some of this material cutting into you, was to lift your legs up on a stool/bench/fallen log, and that seemed to take some of the pressure off. I think it needs more material to make it comfortable. We tried spreading the straps wider, but that spread the Chammock wider, and consequently less material for your bottom, so that didn't work. With a hammock, you have the ability to use it as a chair and a place to recline. With the Chammock, it's purely a chair. So what you want do around camp is going to determine what you need in your gear. Note: my daughter found it the most comfortable. Being smaller (and lighter) seemed to be an advantage. If you know that where you are going is going to have the ability to set up this Chammock, then this can be a nice little item you can throw in your camping bag. It is very compact (you can hang it off your belt when stowed). In your backyard, this could be a good place to try this, especially in summer. It's not a toy, so don't let anyone use it as a swing. If you are a hammock camper, you will not see the benefit of this, as your hammock would meet all your needs. For everyday camping, it's easy enough to bring along, but I wouldn't rely on it for your chair needs. It's more a relaxing spot to sit in intermittently around the campsite, but a chair will have have more flexibility (around tables, campfires). If you want to go with the 2 tree option, then you need to have 2 trees close together and close to your campsite. Whilst it does have ability to carry heavier people, I think there is not enough material to make it a comfortable option for everyone. Update: Here is how to utilise a small sleeping pad in the Chammock. We were gifted this item for the purpose of this review. To find out about how we conduct product reviews and our disclosure policy, please read here.